Do you spend time with your monster? Introducing Alex Noriega and his doodles, Stuff no-one Told me but i Leaned Anyway. True, knowing and accepting your fears is halfway to beating them. my pleasure! 😀 I love Alex Noriega! Ioanna Please email me your address so I can mail the eyeliner pencil to you! I will, i will! 😉 I still can’t believe it! 😀 Thank you so much! I’ve been following Alex for about 3 years and he IS pretty cool. He also blogs his other personal work and since he’s been in Japan (omg or is it China?) it’s been amazing! He doodled what he saw on the streets… worth a look! Wonderful work Ioanna. Great thought. I would have love to spend time with this monster. 🙂 Have a great Sunday. A post that makes you smile and at the same time makes you say, “That’s right!” Thanks. Every second I get! 😀 Love the post! Thanks Paula! 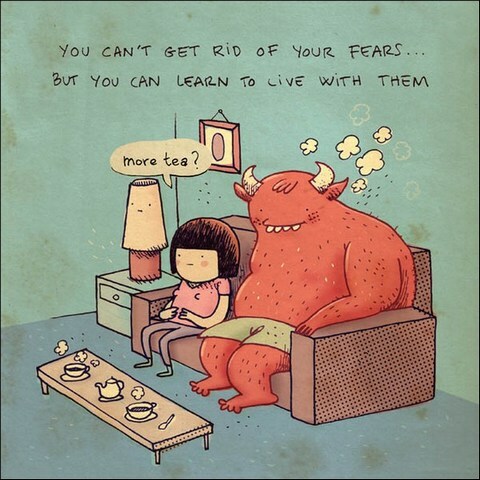 Not many people get to have tea with their monster…. !